Joel Jones and Greg Bunting were strangers before last Saturday, but a chance encounter brought them together. Now these two heroes will be forever connected. Joel Jones was driving with his wife on I-80 near Fairfield, California, when he saw a driver deliberately slamming into other vehicles. “Somebody had to stop him before somebody got killed,” Joel said. A California highway patrol officer pulled the driver over, but then the suspect approached the officer and started punching her violently in the face. He then knocked her to the ground and started stomping on her. Joel knew he had to do something, so he pulled over and came out of his car swinging. Another driver, Greg Bunting, saw the scuffle and pulled over to help. “You don’t turn your back on people who need you. You get involved,” Greg said. Together the two men gained control of the violent driver while Joel’s wife comforted the injured officer, who was later treated for her injuries at a local hospital. 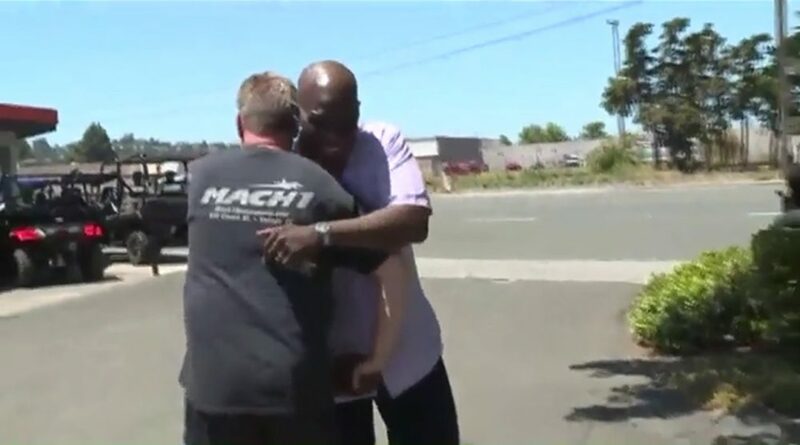 Watch this inspiring video and see these two extraordinary heroes reunite a few days after the incident. Both men believe they were placed in the situation for a reason and were meant to meet. “We’re family,” Joel said, putting his arm around Greg.